چراغی, میلاد, مهرابی, علی اشرف, عرفانی مقدم, جواد. (1395). ارتقای جوانه‌زنی بذر و رشد اولیۀ گیاهچه‌های کلخونگ (Pistacia khinjuk) با استفاده از تیمارهای شیمیایی و فیزیکی. 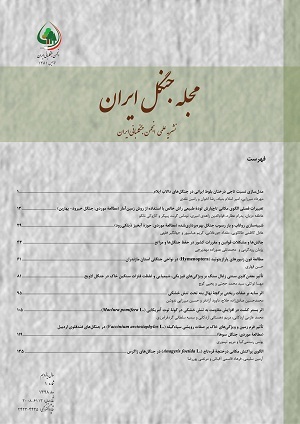 مجله جنگل ایران, 8(1), 119-128. میلاد چراغی; علی اشرف مهرابی; جواد عرفانی مقدم. "ارتقای جوانه‌زنی بذر و رشد اولیۀ گیاهچه‌های کلخونگ (Pistacia khinjuk) با استفاده از تیمارهای شیمیایی و فیزیکی". مجله جنگل ایران, 8, 1, 1395, 119-128. چراغی, میلاد, مهرابی, علی اشرف, عرفانی مقدم, جواد. (1395). 'ارتقای جوانه‌زنی بذر و رشد اولیۀ گیاهچه‌های کلخونگ (Pistacia khinjuk) با استفاده از تیمارهای شیمیایی و فیزیکی', مجله جنگل ایران, 8(1), pp. 119-128. چراغی, میلاد, مهرابی, علی اشرف, عرفانی مقدم, جواد. ارتقای جوانه‌زنی بذر و رشد اولیۀ گیاهچه‌های کلخونگ (Pistacia khinjuk) با استفاده از تیمارهای شیمیایی و فیزیکی. مجله جنگل ایران, 1395; 8(1): 119-128. Pistacia khinjuk, from Anacardiaceae family, is one of the important forest species.In order to break the seed dormancy and increase the germination percentage and rate, and early growth of Pistacia khinjuk seedlings, factorial experiment was conducted as completely randomized design in three replicates with Four factors including: scarification with two levels (control and sulphuric acid (H2SO4) 98% for 10 minutes), stratification with three levels (control, moist chilling in +4°C and dry chilling in -20°C), potassium nitrate (KNO3) with three levels (0, 1% and 2%) and gibberellic acid (GA3) with two levels (0 and 200 ppm) were studied. Evaluation of germination indices and seedling early growth showed that simultaneous effects of three treatments, i.e. scarification seeds with H2SO4 98%, moist chilling and GA3 200 ppm, had the maximum effects on breaking seeds dormancy and increasing the seed germination percentage and rate and also seedling early growth.